The Medicine Man’s Daughter, by Carolyn Noell, is a coming-of-age account of a Liberian refugee who came to Charlotte to escape civil war. With little schooling, Dayou Tucker was placed in sixth grade and began to work on the challenge of catching up academically, adjusting to a new culture and dealing with hepatitis, which she brought with her from Africa. Her parents had used country medicine, like the second skin of a tree, to try to heal her. After moving to the United States, Dayou experienced modern medicine and a liver transplant with a team of healthcare professionals from Carolinas Medical Center. She demonstrated great courage as her small, multi-cultural church found a deep sense of community as they rallied around her. "A poignant and captivating story that reveals not just one woman’s courage, but that of a whole community of friends and strangers whose lives are changed forever by knowing one another." "Carolyn F. Noell weaves a vivid, multi-colored tapestry of images and events that will quicken your emotions as she describes how Dayou Tucker, a thirteen-year-old daughter of a medicine man from Liberia, changed the lives of so many people in a small church community in Charlotte, North Carolina. As you read her words, you will be transported on a journey from the reality of life in war-torn Liberia through a teenager's physical and emotional struggle with hepatitis and the miracle of a liver transplant to the eternal hope we have through faith in Jesus. 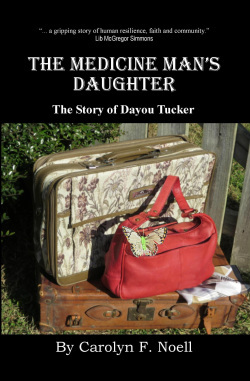 The Medicine Man's Daughter will help you to understand what the life-changing effects of giving unconditional love have on the lives of others as well as your own." - Dale R. Harlan, Executive Director of Love in the Name of Christ of Mecklenburg County, N.C.
"Carolyn Noell toggles back and forth between war-torn Liberia and an urban setting in the southern U.S. to tell a gripping story of human resilience, faith, and community. Noell does a masterful job of integrating accounts of Dayou Tucker’s African upbringing, the welcome she received from an inter-racial N.C. Baptist church, and the support with which she was surrounded as she faced end-stage liver disease and received an organ transplant." "As the spouse of a liver transplant recipient, I was particularly transfixed by Noell’s grasp of this complicated journey. She and others walked beside Dayou when days and nights were long and challenging, and Noell conveys both the joy and the pain of the trek with honesty and grace."